According to ThinkGeek, everybody in the future will have their own sophisticated robotic arm to do the dishes, assemble lego and clean up for us. 🙂 This Robotic Arm Kit is the next step towards that future. 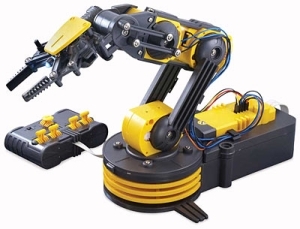 The Robotic Arm Kit has 5 axis of movement that can be controlled by a wired remote control. Command the gripper to open and close, wrist motion of 120 degrees, an extensive elbow range of 300 degrees, base rotation of 270 degrees, base motion of 180 degrees, vertical reach of 15 inches, horizontal reach of 12.6 inches, and lifting capacity of 100g. whew! An LED spotlight on the gripper illuminates your work. Soon you’ll be creating your own tiny union-free automobile assembly line. As this robotic arm is a kit, it requires you to build the thing first. The parts do not require any soldering but you will need to follow the step by step instructions carefully which will take you a couple of hours to complete. The Robotic Arm Kit is available from ThinkGeek and currently costs $49.99. Awesome robotic arm.. just don’t think this robot arm can do the dishes though..